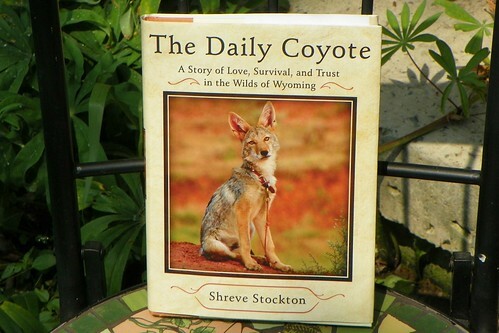 The Daily Coyote: A Story of Love, Survival, and Trust in the Wilds of Wyoming by Shreve Stockton. Simon & Schuster 2008. After a couple of years in San Francisco, the time had come when Shreve Stockton was ready to move back to the city of her passions, New York. She decided to take her time, and make the six thousand mile trip across the continent on her little 150cc Vespa ET4 over a couple of months. Her plans went awry when she reached Wyoming. Not that anything terrible happened, quite the contrary. She fell in love with the countryside. Once she reached New York, she found she couldn’t settle down and forget Wyoming. She searched the internet for Wyoming rentals and came up with a house in the tiny town of Ten Sleep, about a hundred miles south and west of Sheridan. Within weeks, she was moving in. For a city girl accustomed to the bustle of New York, it was like moving to a different planet. As Stockton began to settle into her new surroundings, she met John, a rancher who would become first a friend and then a romantic partner. In Wyoming, coyotes are detested pests, shot on sight by ranchers, and hunted by government agents. It was through John, a coyote hunter, that Shreve acquired an orphaned coyote pup that John unaccountably chose to rescue. Soon named Charlie, the pup became a central part of her new life. A photographer by training, Shreve began recording the pup’s activities and sending out photos to friends and family each day. The emails were titled The Daily Coyote. Stockton relates both the story of Charlie’s first year with her, and her own adjustment to rural Wyoming as she takes up life in a twelve by twelve foot cabin. The Daily Coyote is an interesting animal story but it is much more. Writing in an easy, forthright manner, Stockton brings the Wyoming landscape to life and offers a thoughtful reverie on our relationship with nature and a world unknown to most city dwellers. The text is complimented by beautiful photographs of Charlie and the wilds of Wyoming. You can visit Stockton’s website and blog at DailyCoyote.net. This entry was posted in Non Fiction and tagged Charlie the coyote, coyote orphan, raising a wild animal, Shreve Stockton, Ten Sleep, The Daily Coyote, wyoming. Bookmark the permalink.